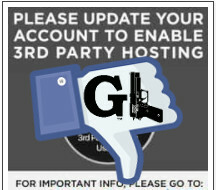 We have had a number of requests for help using some of the GunLink Forums' features. In this thread we will go over how to use some of the available features using the buttons or BBCode. Most of this will hold true for many online discussion forums. If you have more questions about how to use the forums, ask here. To post photos on the forums, the photo must be already hosted online with a photo host. To include a photo in a post, the URL address to the image must be wrapped in [img][/img] tags. One of the most popular sites that people use for embedding photos, PhotoBucket, made some changes a few months ago to prevent hotlinking/embedding images with free accounts. Images can still be hotlinked from PB with an (expensive) paid account, but there are a number of cheaper/free alternatives for photo hosting, including SmugMug, Flickr, ImageShack, IMGUR, PostImage, and others. You can use the button above the post editor (between and to add the BBCODE [img][/img] wrappers to the post. By default, it will place empty [img][/img] tags into your post that you should copy/paste your image URL into between the open and close IMG tags. You can also paste in your image URL, highlight the URL, and click the button to automatically wrap it in [img][/img] tags. (3) click the image tag button. To post YouTube viceos on the forums, you can use the button above the post editor to insert [youtube][/youtube] tags. (1a) Clicking the youtube button inserts the YouTube open/close tags into the post (1a). 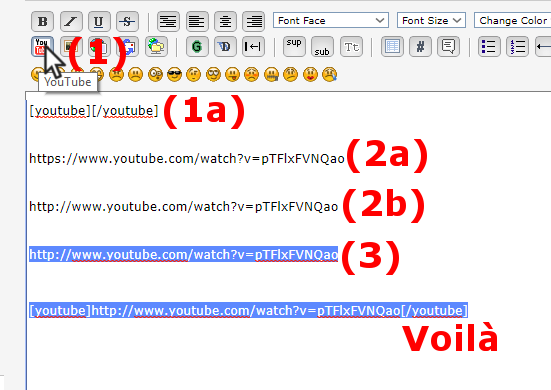 You can then post the YouTube video URL* inside of the tags to embed it. *YouTube gives you the URL with the HTTPS address. You will need to remove the "S" to make it "HTTP" for the embed to work.